ESCONDIDO – The executive director of NCTD (North County Transit District) Matthew Tucker described the situation as “embarrassing,” “challenging,” and “difficult,” at having to halt their Sprinter light rail services starting at midnight because of the discovery of faster than anticipated wear on all of the trains’ friction braking system rotors. 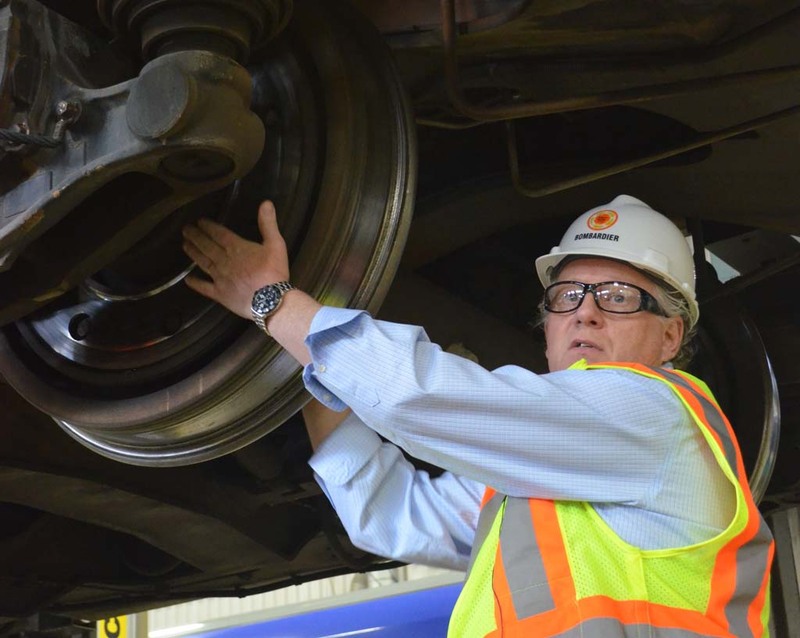 Along with NCTD, two of the transit service’s primary contractors Veolia and Bombardier have been investigating one of three braking systems on the light rail cars, explained Deborah Castillo, a spokesperson for NCTD.“There are three braking processes on the train. One braking process, the friction braking, is the matter of the issue we’re discussing today,” said Matt Byrnes, vice president of Bombardier Services at a press conference Friday.“The rotors have been wearing significantly faster than the manufacturer anticipated,” he said. “We’ve undertaken significant testing in conjunction with NCTD to assess the safety implications; the tests have shown to date, and continues to show that the braking performance of this vehicle is as good, if not slightly better, than the day it was first delivered. There’s been no safety concerns whatsoever,” he added. The problem was identified late last week, according to Tucker. “No one fully understood the scope of the problem,” he said, which is why it took time to understand what the problem was. There is no timetable for when any Sprinter service will resume, much of that is because NCTD doesn’t yet know when they will be able to receive new parts from Faiveley Transport, which offers services and equipment for rolling stock, and has their headquarters in France. Byrnes was quick to add that Faiveley was “not at fault,” and are providing every assistance possible. “We’ve been liaising with the supply chain to understand alternatives to supply and expediting that supply,” Byrnes said. He said that they should be in a better position in the early part of next week to confirm that supply. The parts are very customized, Tucker explained, adding that they will begin to find more cost effective and efficient methods to maintain the vehicle in the future. It’s unknown how much it will cost NCTD to repair all trains, but Tucker said that a lot of the costs would have been incurred anyway. “Essentially the big dealt is going to be what is the cost difference between operating the train and operating the supplemental bus services,” he said. Tucker also said they haven’t discussed whether the private contractors would help to pay for the extra transit services. For the weekend of March 9 and March 10 they will offer a special express bus service that will operate between Oceanside Transit Center and Escondido Transit Center. It will make stops between the Oceanside Transit Center, Vista Transit Center, Palomar College, Cal State San Marcos and the Escondido Transit Center. The buses will run every 30 minutes, which, Castillo said, means a one-way trip will last 45 minutes for travelers. Castillo said they will have more information Sunday regarding service for the rest of the week, but assured that they will offer services during the week. She added that the Sprinter transit centers would remain open and they will be fully staffed to assist travelers. The suspension of services comes a day before the Sprinter was to celebrate its 5th anniversary. That event scheduled for March 9 has since been cancelled.